Is the new Intel P55 causing headaches for iPhone users? A peculiar set of circumstances currently drawing attention on an Apple discussion website suggests that iPhone users running Windows 7 may be unable to sync their phones if their PC uses one of Intel's newest chipsets. 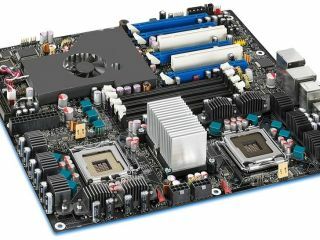 The hardware in question is the P55, which was released in September and can be found in motherboards from MSI, Gigabyte and Asus. According to the Apple forum, the P55 appears to be combining with Windows 7 and iTunes 9 to create an error that prevents iPhone synchronisation. While Microsoft and Intel are looking into the problem, Apple has yet to respond to questions about the possible cause and a remedy for affected iPhone owners. So far, the issue is of relatively minor interest to the tech community, but the fact that the P55 is likely to be in the new 27-inch iMacs due later this month from Apple should focus a few minds on cracking the problem.